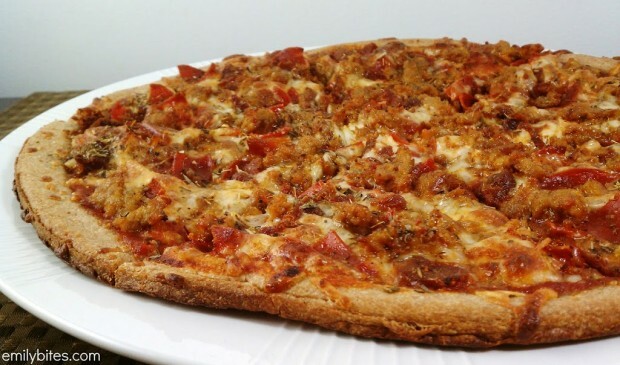 Meat Lover’s Pizza is typically one of those ultimate indulgences you crave when you want to “be really bad.” Ordering a pizza loaded with all those meats feels decadent, over-the-top and a little dangerous. It’s a shame those feelings are often followed by a tight waistband and a generous helping of guilt. This pizza is the perfect way to give in to your craving and feel good about it afterward! It even takes less time to put together than it does to call and wait for delivery. If you’re looking for saucy, cheesy pizza piled with spicy sausage, zippy pepperoni and smoky bacon, look no further. 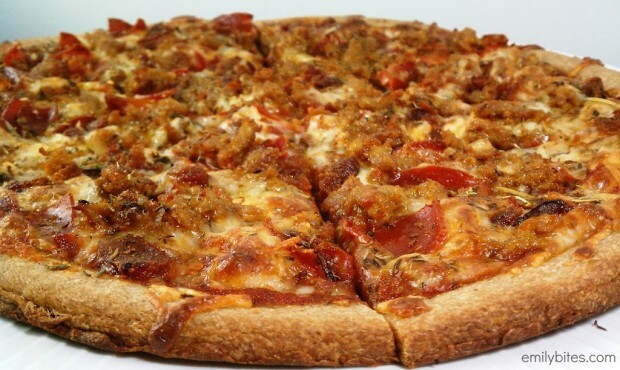 You can have you Meat Lover’s Pizza and eat it too. My Meat Lover’s Pizza recipe was featured in Oprah’s lineup of “Decadent Comfort Food for Calorie Counters” on Oprah.com! Spread pizza sauce evenly across the top surface of the pizza crust, leaving at least a ½ inch edge around the outside. Sprinkle the shredded mozzarella evenly over the top, followed by the pepperoni pieces. 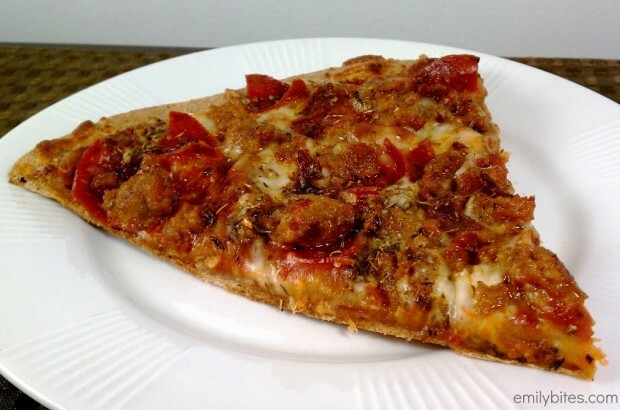 Spread the cooked sausage crumbles evenly across the pizza and follow with the bacon bits. Finish the pizza by sprinkling the Italian seasoning over top. Hm. I don’t know what grocery stores you have nearby, but if you have a super walmart they have both! Let me say, Pizza Hut’s meat lovers pizza is one of my favorites, but after making this tonight, I have a legitimate replacement for take out pizza. My Kroger didn’t have turkey pepperoni, so I subbed Canadian bacon, which should have kept the calorie count pretty close. This was delicious, and I have two more meals out of it. Yum, yum yum. After making the chocolate donuts last night, and this tonight, you definitely have a new fan. Thanks Emily! I’m actually planning on making pizza this weekend, from the just-add-water dough mix. I was going to do turkey pepperoni and turkey meatballs. But I like the idea of adding the bacon bits, too! I would’ve never thought to do that. Just made this tonight for my boyfriend and I and we LOVED IT! 🙂 The only change I made was added green peppers simply because I had one that needed to be used. Where is the pizza crust located at the stores? Is it refrigerated or frozen etc? Thanks! Cant wait to make this! Lindsey – pizza crust is in the aisle with the tomato and pizza sauces, usually. Boboli doesn’t need refrigeration, so it’s usually around there. 🙂 Can’t wait to try this recipe myself! Thanks Emily, you ROCK sistah! How many slices should you make? 4-6-8? We made this for dinner tonight and it was great! I was a little worried about the cheese (it didn’t look like much on the pizza), but my fears were erased after the first bite. It just didn’t need that much with all of the other flavors that were going on! I had 2 big slices with some steamed green beans and it was perfect! I didn’t feel bloated like I normally do after pizza. This is going into the regular rotation. PS: Kelly Douglas, the sausage I used was 5p+ for 4oz of hot Italian turkey sausage.